This is my long awaited text on missional hermeneutics. I wrote it in order to help church planters, pastors and teachers of the Bible to proclaim the life transforming message of Scripture in our post-Christian, multi-cultural, pluralistic, and urbanized world. (1) Find a clear summary of the Scriptural Story from Creation to New Creation. The distinctive approach of (re)Aligning is that it begins with Jesus’ announcement of the Kingdom and his calling of his first disciples. (re)Aligning with God then moves back to Creation in Genesis 1 and shows how the Old Testament narrative moves forward to its climax in the life, death, and resurrection of Jesus. (re)Aligning with God then shows how the early church under the empowerment of the Holy Spirit proclaims the good news of the Kingdom in anticipation of the New Creation. Throughout readers will hear Scripture’s call to (re)align themselves with God in order to live as a missional community that reflects God’s character to/for/in the nations. (2) Discover how Israel’s Prophets, the book of Psalms and Israel’s Wisdom traditions fit into a missional approach. Most overviews of the biblical narrative offer little or no reflection on this large block of Old Testament Scripture. (re)Aligning with God offers a substantive reading of the role of the entire Old Testament including these often neglected sections. For example, regarding the book of Psalms, (re)Aligning with God reflects on how to read it as God’s prayer book for God’s missional people. (3) Find a clear methodology for applying a missional reading or hermeneutic to their own interpretive work on Scripture. I’ve worked intentionally to offer a step-by-step guide to the process. This work comes out of my own experiences in church planting, preaching/teaching in a wide variety of settings, and teaching biblical interpretation to hundreds of pastors and leaders at Asbury Theology Seminary. (4) Learn key differences in reading the Bible for Church (insiders/believers) and World (outsiders/seekers). As we seek to advance the Christ following movement in the 21st century, it is critical to read the Bible for both groups and do so critically and intentionally. (re)Aligning with God makes a compelling case that we can do this effectively in ways that will lead to the renewal of current Christ followers and the initial aligning of former outsiders with Jesus’ kingdom. (5) Encounter not only a summary of the over arching missional narrative of the Bible, but read full interpretations of an OT book: Jonah and a NT book: Philippians through the lens of a missional hermeneutic. (6) Reflect on how to unleash the true power of Scripture to transform its readers/hearers by implementing a missional reading within your community of faith. (re)Aligning with God offers practical suggestions and strategies that can be applied immediately to your context. If you have any questions, I am happy to converse in the comments below or via email: brian.russell9113 @ gmail.com. It's finally out! 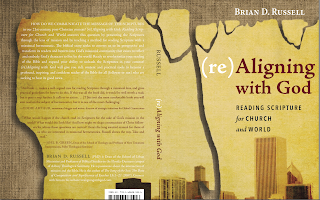 My text on missional reading: (re)Aligning with God: Reading Scripture for Church and World is now available. I am pleased to announced the publication of (re)Aligning with God: Reading Scripture for Church and World. This is my introduction to a missional reading of the Bible. I wrote it for church planters, pastors, teachers, and seminarians to serve as a guide to unleashing the power of Scripture in the advance of the Christ following movement in the 21st century. This book...makes a well–argued case for reading Scripture through a missional lens and gives practical guideline for how to do this. If this were all the book did, it would be well worth a read; but it goes a step further. It calls us to action...This isn't the most comfortable book you will ever read on the subject of hermeneutics, but it is one of the most challenging. What would happen if the church read its Scripture for the sake of God's mission in the world? What would this look like? And how might we shape communities of Christ followers for whom these questions are central? Here's the long-awaited manual for those of us who are interested in missional hermeneutics. Russell shows the way. Take and read.